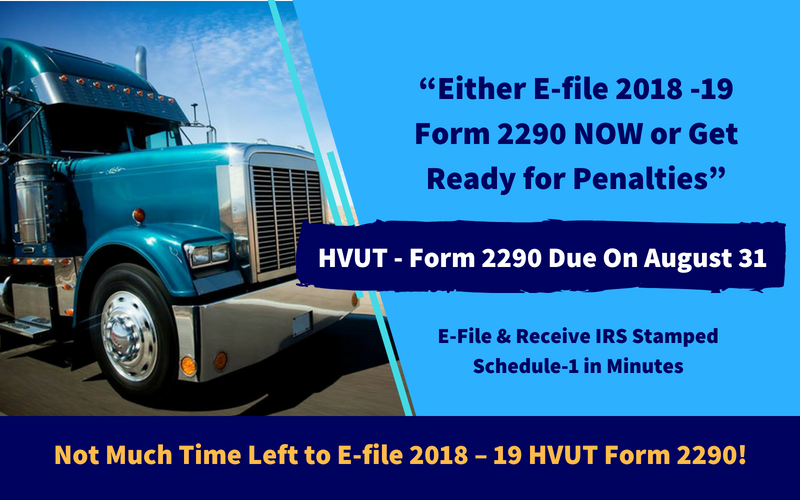 Electronic filing is required for each return reporting and paying 2290 tax on 25 or more vehicles. However, all taxpayers are encouraged to file electronically. Electronic filing generally allows for quicker processing of your heavy highway vehicle use tax return. A stamped Schedule 1 can be available within minutes after filing and acceptance by the IRS. Why to e-File 2290 with TaxExcise.com? As like every year August 31 is the due date and there won’t be any extension further, this year August 31 is the deadline. This generally applies to Form 2290 and the accompanying tax payment for the tax year that begins on July 1, and ends on June 30. Returns must be filed and tax payments made by August 31 for vehicles used on the road during July. For vehicles first used after July, the deadline is the last day of the month following the month of first use.